Data is like a currency in the digital world. You keep it safe, it keeps working for you, if you lose it, it becomes impossible to get it back. While there are a lot of software which might restore data, there is still a room for a smart strategy to backup everything. That said, there are a lot of ways to backup data. You can save it in the cloud, you can save it on external disks, NAS-storage hosted solutions and more. However, just doing a backup is not enough, you need to be strategic, and systematic about it. Today, we are talking about Hybrid Backup Strategy. If you perform a local backup and then upload it to the cloud – it will put pressure on the computer, especially if you encrypt or compress the data. Hybrid backup allows you to simultaneously backup to your local destination and to the cloud (firstly to a local one, secondly to the cloud). It gives you an opportunity to protect your data more. There’s a well-known saying “don’t put all your eggs in one basket”, it’s about that. 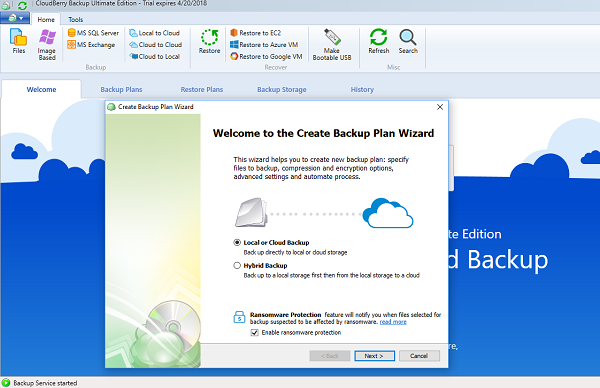 Hybrid Backup using CloudBerry Backup combines these steps into one. It performs encryption and compression once on the local storage or NAS. Afterward, the already secure backup is then uploaded to the AWS. It reduces the workload on the main computer, and keep things simple. It uses 3-2-1 backup strategy which makes sure your backup copies is spread across storage sites, maintain original, backups, and also makes sure you have a copy of data outside your primary office. If it sounds too technical-savvy, it is actually that, and it follows the rules, and compliance many companies need to follow it. 3 — It will keep three separate copies which do not influence each other. One is a copy of the actual data, and rest of the two are backups. 2 — The copies are stored on two physically independent devices. 1 — There is at least one copy of data which is outside of the primary data center or away from your office to make sure if there is a catastrophic failure, there is at least one copy data still left. In the recent version of CloudBerry, the company has enabled ransomware protection. It will protect backup data from being overwritten by encrypted ones. It can detect encryption changes in files and prevents existing backups from being overwritten until an administrator confirms if there is an issue. However, you will need to enable this during the setup process. Once you activate your copy of the software, you get the direct option to start a backup of Files, Image-Based, MS SQL Server, and MS Exchange. If you are new to this, I will suggest starting with files to get started. Select Files > Switch to Hybrid Backup > Make sure to select Enable ransomware protection. In the next screen, click on Add New Account. Next, under File System Storage Account, you will have to choose the path to your network drive or local storage. This is your first destination. Under tab Consistency Check, you can provide an encryption password, and set up a schedule which could be either a specific date and time or recurring or just manual. Click Next, here you can configure your AWS account. You will also get to see the cost estimates. Once complete, you can kick-start your backup manually, and it will automatically upload it to the cloud. CloudBerry Backup offered most of the popular cloud storage providers (AWS, Google Cloud, Microsoft Azure) and you can choose the one you already use, and when it comes to local storage, it supports NAS and SAN devices as well. Bird eye dashboard to see all your backup plans in one place. You can see upcoming backups, last run results, settings for the software, and storage accounts. Other tabs offer you Backup Plans, Restore Plans, Backup Storage, and history. Under Backup Storage, you can view breakdown listing archives, cloud to local, image-based, and so on. 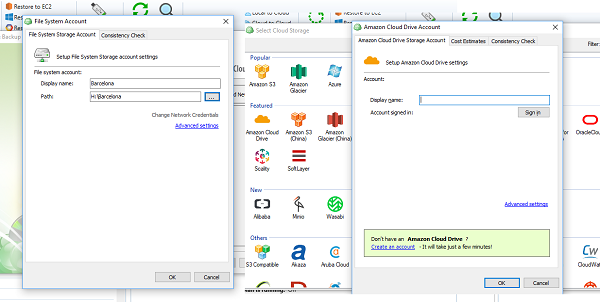 You can also create backups for cloud to cloud, cloud to local and local to cloud. Backup configuration if you are formatting your PC. You can manage bandwidth consumption, proxy, retention policy, Notification via email, memory allocation, logging, and so on. The ultimate version of CloudBerry Backup will cost you $ 299.99 which comes with all the advanced features we talked about, but if you need less option, you can choose individual versions which will cost you less. There is a Pro version which will cost you $ 49.99. It also offers a free solution which is designed for personal use only. The company also offers 15-day trial edition which allows you to switch between different editions to clearly understand the difference between the software or switch to freeware if you do not want to use it at all. You can download the trial or buy it from their official website.